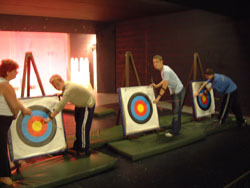 215 Squadron has recently introduced 'Archery' as one of its extra-mural activities with a £1000 grant being donated by local business. 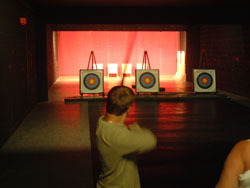 Four Staff now hold the Archery Leaders Qualification as well as a First Aid Qualification to organise this activity in a safe and controlled environment. Civilian Instructors Richard Hearn, Terri Brannigan (f) , Charlotte Davies (f) and Instructor Flight Sergeant Daniel Conboy are the instructors in this activity and the Squadron has the ability to organise four firing points within the confines of the TA Centre. 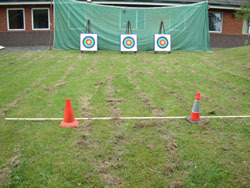 Civilian Instructor Terri Brannigan (Chief Instructor) has also set up the 'Arrows' Club within the Range Facility of the Headquarters, which ensures the project can continue throughout the whole of the year. 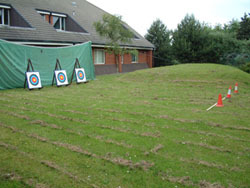 The 'Arrows' will be holding their first Squadron 'Open Championships' this year and they have also set up a number of training days for local Squadrons, who are keen to use the Squadrons many diverse activities. 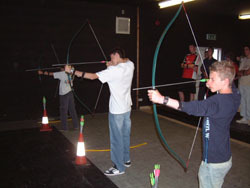 The 'Arrows' have also received further sponsorship to purchase equipment, such as safety netting etc, to organise this activity in a number of sites off Squadron. Any Squadron wishing to use this superb facility is requested to contact Flight Lieutenant P C Flower.